What are clef symbols, and why are they the first symbol placed on a staff? In the first lesson of this section, we learned that a musical staff consists of five lines and four spaces, and that each line or space corresponds to a musical note. What we didn’t discuss yet is which notes the various lines and spaces correspond to. And there is a fantastic reason for that – it’s impossible to determine which note is represented by each line/space until we place a clef symbol at the beginning of the staff. Hmm, we can probably spot a major problem right away, though. If we place a note on one of the lines or spaces on this “infinite staff”, how in the world are we going to be able to figure out which note it is, at a glance!? The question is, which five lines are being highlighted? It’s possible to move the highlighted area (in the picture above) higher or lower, anywhere we want on the infinite staff (kind of like the Range Game from the Price Is Right.) This is where clef symbols come in. Clef symbols determine which five lines from the “infinite staff” are currently being highlighted, or focused on. These are the 4 main clefs used nowadays (not including percussion instruments). What’s the point of having a bunch of clefs to choose from? What makes us choose one over another in a given situation? Let’s say we’re writing for a specific instrument. Every instrument has a certain range, as we learned. That obviously means we have to restrict all the notes we write to be within that range. Otherwise, when the musician tries to read the music, he/she will not be able to play certain note(s), because it’s impossible (or extremely difficult) on that instrument! In choosing the best clef symbol, it makes sense to use one that focuses the musical staff on as similar an area as possible to the range of the instrument we’re writing for. This way, the notes will mostly be in the center of the staff, not way up high or down low. This is why there are several clef symbols to choose from. Some focus the musical staff up in a higher octave register, some place it lower down, some in the middle. We can choose the one that fits best for each situation. 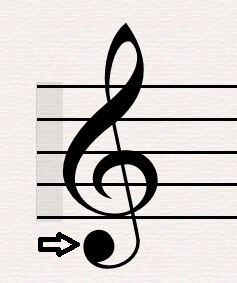 Sometimes it’s possible to guess what instrument is being written for, just by looking at the clef. For example, an alto clef on a staff of a musical score (music written for multiple instruments to play all together, like a symphony for example), is nearly always for the viola (an instrument in the violin family). Alto clef fits the range of a viola just right, so that’s the “clef of choice” for viola players. 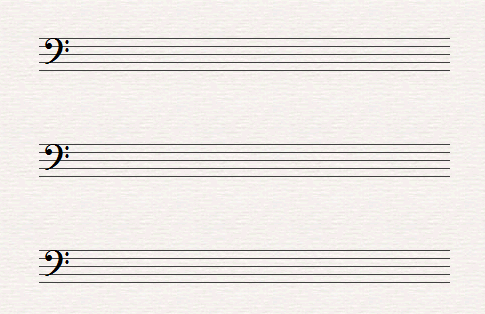 The clef is usually repeated on every single line of the music (except in certain styles). This way, the player never has to think about which clef they’re reading from, because it’s always right there in front of them. Without clef symbols, we would have absolutely no way of knowing which note was associated with which line or space. For example, what note is the lowest of the 5 lines on the staff? 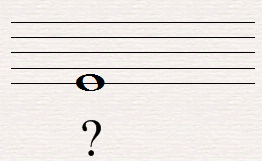 The answer depends completely on which clef we’re using. In treble clef, it’s the note E4, in bass clef it’s G2, in alto clef it’s F3, and in tenor clef it’s D3. So you can see that until we determine which clef we’re in, the lines and spaces are meaningless! That’s why they’re the very first symbol on the staff. Once we put a clef symbol at the beginning of the staff, immediately each line and space becomes associated with a specific note. Now we’re in business. Where would you find a clef symbol on a piece of music? What’s the point of a clef symbol? Which clef is the viola known for? Do any music symbols appear earlier on the staff (to the left) than a clef symbol?